Randy Stukenberg - For Shaw Media The Crystal Lake Central cheerleading team performs during the DeKalb Sectional Cheer contest Saturday, Jan. 20, 2016. Randy Stukenberg - For Shaw Media From left, Crystal Lake Central coaches Elizabeth Brauneis, Christina Ostien and team member Allison White shout encouragement during the team's performance at the DeKalb Sectional Cheer contest Saturday, Jan. 20, 2016. Randy Stukenberg - For Shaw Media The Harvard cheerleaders start off their routine during the team's performance at the DeKalb Sectional Cheer contest Saturday, Jan. 20, 2016. Randy Stukenberg - For Shaw Media Hampshire cheerleaders, from left, Kasey Reigner, Gianna Borecky, Rachel Fischer and Emily Krawczyk encourage their teammates during the team's performance at the DeKalb Sectional Cheer contest Saturday, Jan. 20, 2016. Randy Stukenberg - For Shaw Media Harvard cheerleaders form a pyramid during the team's performance at the DeKalb Sectional Cheer contest Saturday, Jan. 20, 2016. Randy Stukenberg - For Shaw Media Marengo cheerleaders hold up a teammate during the team's performance at the DeKalb Sectional Cheer contest Saturday, Jan. 30, 2016. Randy Stukenberg - For Shaw Media From left, Marengo cheerleaders Victoria Irrazary, Celia Alvarez and Jessica Gundelach support a teammate during the team's performance at the DeKalb Sectional Cheer contest Saturday, Jan. 30, 2016. Randy Stukenberg - For Shaw Media Marian Central cheerleaders cheer during the team's performance at the DeKalb Sectional Cheer contest Saturday, Jan. 30, 2016. Randy Stukenberg - For Shaw Media Marian Central cheerleader Sierra Teeter cheers during the team's performance at the DeKalb Sectional Cheer contest Saturday, Jan. 30, 2016. Randy Stukenberg - For Shaw Media Marian Central cheerleader Lindsey Willis jumps during the team's performance at the DeKalb Sectional Cheer contest Saturday, Jan. 30, 2016. 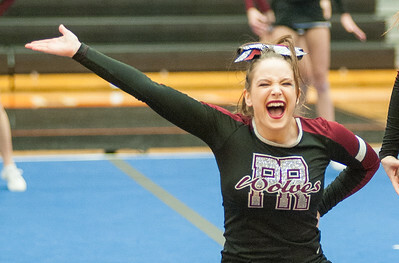 Randy Stukenberg - For Shaw Media Prairie Ridge cheerleader cheers during the team's performance at the DeKalb Sectional Cheer contest Saturday, Jan. 30, 2016. Randy Stukenberg - For Shaw Media Prairie Ridge cheerleaders Grant Bowman and Quinn Regner finish their performance during the DeKalb Sectional Cheer contest Saturday, Jan. 30, 2016. 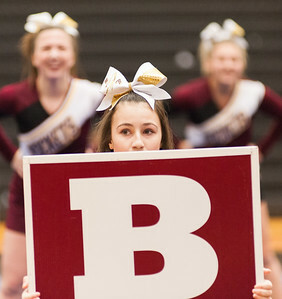 Randy Stukenberg - For Shaw Media Richmond-Burton cheerleader Gaby Caruso looks over her sign during the team's performance at the DeKalb Sectional Cheer contest Saturday, Jan. 30, 2016. 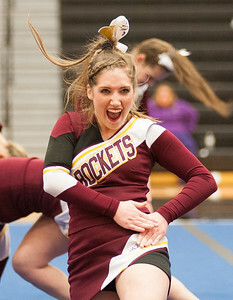 Randy Stukenberg - For Shaw Media Richmond-Burton cheerleader Carly Stevens cheers during the team's performance at the DeKalb Sectional Cheer contest Saturday, Jan. 30, 2016. From left, Marengo cheerleaders Victoria Irrazary, Celia Alvarez and Jessica Gundelach support a teammate during the team's performance at the DeKalb Sectional Cheer contest Saturday, Jan. 30, 2016.